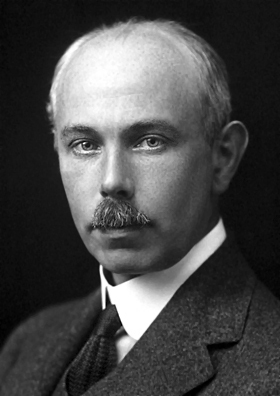 Francis William Aston FRS (1 September 1877 – 20 November 1945) wis an Inglis chemist an pheesicist wha wan the 1922 Nobel Prize in Chemistry for his discovery, bi means o his mass spectrograph, o isotopes, in a lairge nummer o non-radioactive elements, an for his enunciation o the whole nummer rule. He wis a fellae o the Ryal Society an Fellae o Trinity College, Cambridge. ↑ 1.0 1.1 Hevesy, G. (1948). "Francis William Aston. 1877-1945". Obituary Notices of Fellows of the Royal Society. 5 (16): 634–626. doi:10.1098/rsbm.1948.0002. JSTOR 768761. ↑ "The Nobel Prize in Chemistry 1922". Nobel Foundation. Retrieved 2008-04-14. ↑ Squires, Gordon (1998). "Francis Aston and the mass spectrograph". Dalton Transactions (23): 3893–3900. doi:10.1039/a804629h. Retrieved 2007-12-06. ↑ "Dr. F.W. Aston Dies. Winner of the Nobel Prize in Chemistry in 1922. Noted for His Work With Isotopes. In Tour of This Country 23 Years Ago, He Foresaw the Releasing of New Energy. Developed Isotopes. Headed Atom Committee. Lectured in This Country". New York Times. November 22, 1945. Retrieved 2010-08-06. The death of Dr. Francis William Aston, fellow of the Royal Society and Fellow of Trinity College, Cambridge, was announced today. He was 68 years old.